Are there any foods that really remind you of being a little kid? 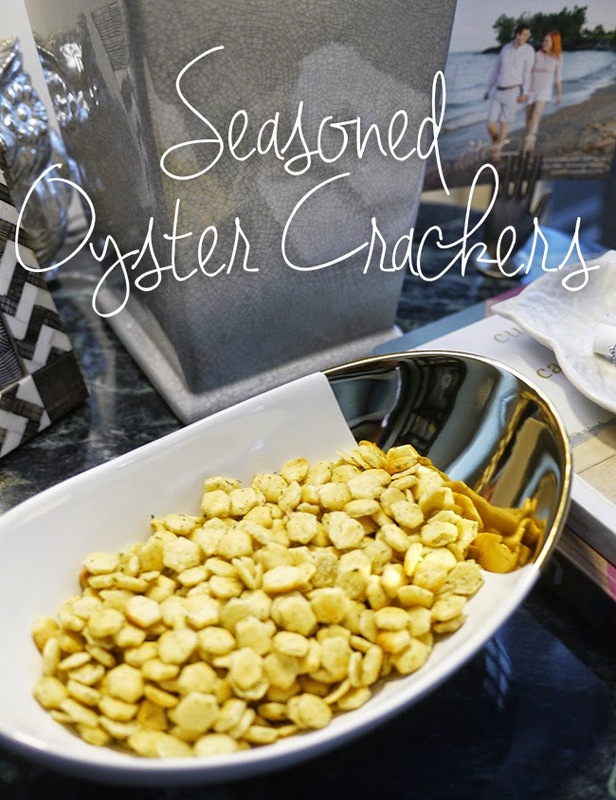 For other people it may be pudding cups or a Fruity Pebbles, but for me it's these seasoned oyster crackers. My family used to serve these at every party, and the kids would pound these down. They're really addictive, I remember eating them until I felt sick. I was looking to make a little party snack for a tailgate down at Illinois a couple of weekends ago and I decided to bring them back. They are just as good now as my childhood brain remembers. Mix oil, garlic powder, dill, and Ranch together in a large container with a lid. Add crackers and coat evenly. Cover and let sit for at least one hour. Serve! Yum these sound so good! I used to love oyster crackers as a kid, I think I need to bring them back into my life now. My kid food was those keebler cookies with the hershey's kisses in them. So tasty! YUMMM!! I love anything with carbs and crunch - and these are perfect! Oh I haven't had these in years!!! So yummy.. I absolutely love these..so good!